I was wandering around the garden looking for new colour, when I started thinking about using the then abundance of rhubarb in the vegie patch, and pairing it up with some of the beautiful crimson roses covering one of the arbors as it was providing a lovely show with a very heady scent. Wash the rhubarb and trim the ends before cutting it into 1 cm (1/2 inch) pieces. Rinse the rose petals in cold water and drain. Put the rhubarb into a medium, non-reactive pan, sprinkle over the sugar and drizzle with the lemon juice. Cover with the lid and place on a very low heat until the juices start running. Gradually increase the heat, stirring until the sugar has dissolved, and bring to the boil. Add the rose petals and stir to evenly distribute them throughout the rhubarb mixture. Boil rapidly, until the jam reaches setting point. Once setting point is reached, remove the pan from the heat and skim off any scum and discard it. 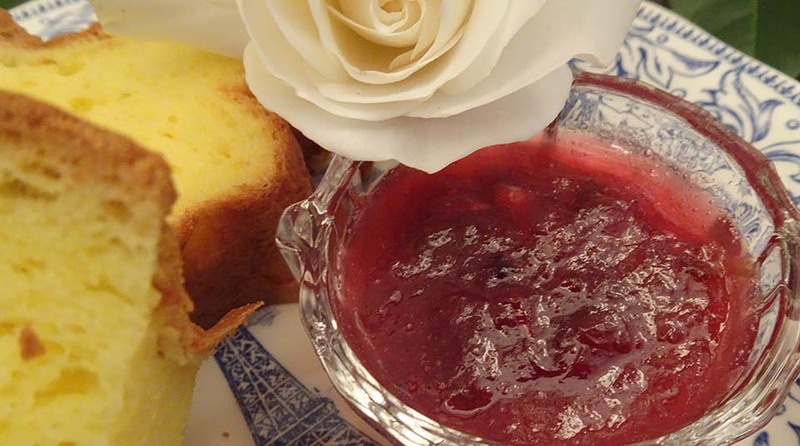 If the jam does not have a lovely strong rose flavour, add a little rose water to taste. Pour into warm sterilised jars, and seal. Once cooled, lable and store in a cool, dark place. Lable and store in a cool, dark place. Use freshly picked, unsprayed rose petals from the garden. Do not buy them from a florist, as it is likely that they have been sprayed with pesticides, etc. If using roses with large petals, it is best to remove the heel of the petal (the white bit at the bottom). Delicious on freshly baked brioche, with scones and cream, or paired with cream to fill a vanilla sponge.